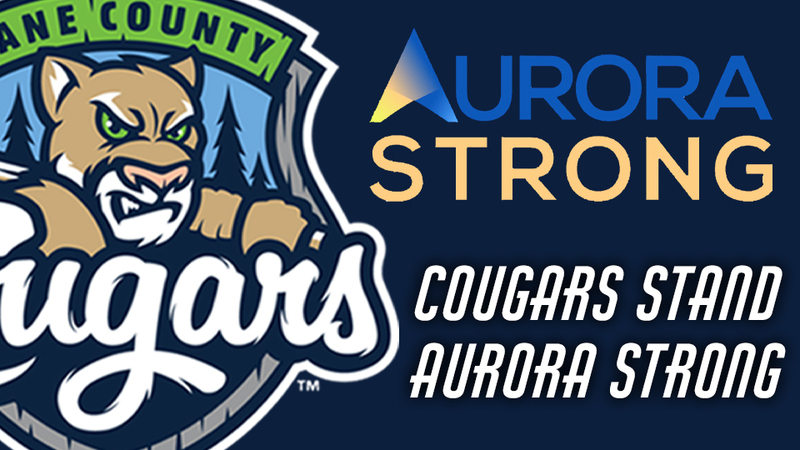 GENEVA, Ill. - The Kane County Cougars and the Kane County Cougars Baseball Foundation, Inc. have announced that they will donate a portion of the 50/50 raffle proceeds to the Aurora Strong Community Fund for the 2019 season. Following the tragic event that took place at the Henry Pratt facility on February 15, the Cougars organization began brainstorming ways to show support for their local community. The decision was made that half of the proceeds raised through the sale of 50/50 raffle tickets throughout the 2019 season will be donated to support the families of the employees who lost their lives to this senseless act of violence. Fans visiting the ballpark during the 2019 season can participate by purchasing 50/50 raffle tickets. Monies raised will be provided to the families via the Kane County Cougars Baseball Foundation, Inc. with the assistance of the Aurora Policemen Credit Union at the end of the 2019 season. Additional details regarding an employee appreciation night for members of the Henry Pratt company as well as a first responders appreciation night for the Aurora Police and Fire Departments will be announced at a later date. The Cougars 2019 season begins on Thursday, April 4 at 6:30 PM against the Clinton LumberKings. For more information, including the full schedule of theme nights, entertainment acts and giveaways, visit www.kccougars.com. Follow the Cougars on Facebook, Twitter and Instagram for updates on tickets and promotions.